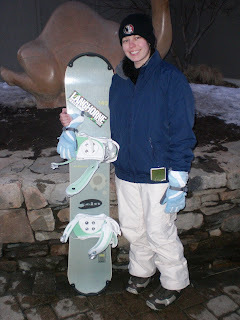 You may remember that we spent a day at Lake Tahoe last year, and that we really love snowsports. This year, time almost got away from us, since we only got around to spending a day in the mountains in the first week of March... after peak ski season in this area. But, we made it, and it was a good time. I took very few photos, which is a near-first. I really took the helm at planning this trip, from choosing a resort and figuring out where to rent equipment to working out directions and lodging. It wasn't the easiest thing ever, but I think we made good choices. Friday night, Jonathan flew back from a business trip, packed his bag, and we were out the door. We stopped at Langhorne Ski & Sport, where I rented a snowboard and boots, and Jonathan got boots (he brought his own snowboard this trip). The guys helping us were very friendly and very helpful. I had a 149cm board and size 9 boots (I'm kinda putting this here so I remember what to get next time, LoL), and they worked out wonderfully. Renting and returning were quick, easy, and inexpensive. I drove up to East Stroudsburg, as Jonathan needed to work on the way up. We arrived at Budget Inn & Suites close to 11pm, and had a devil of a time finding our room. The setup is awful, and the signage is poor. From the parking lot we walked in on 4, went up a floor to 5, crossed over into the other building, went down a floor to 1, then up a floor to 2, where our room was. I'm not even lying. Then we ran out for a quick Arby's drive-thru run, and then pretty much went to bed. The room was nothing special. The closet had the doors removed, and it was kinda small. The (king-size) bed was soft and the television was very nice. It was one of the cheapest within 15 miles of the resort (we paid $75 with tax; regular rates start at $97), but not really worth the price (but I doubt anything really is in that area during this season). It was nice to only have a 15-20 minute drive in the morning, tho. 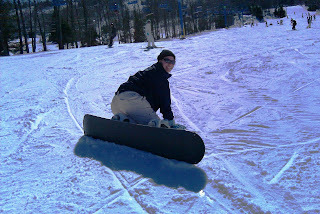 I picked up toe-side pretty quickly, and I got the "leafing" thing fairly easily as well. I had a really good time doing that. I never did get the whole heel-side thing... for two reasons: first, I struggled to get up heel-side (I only accomplished it 4 times AT MOST), and second, I got too fearful to switch from toe to heel because I had a few bad falls and was afraid I'd get really hurt trying again. 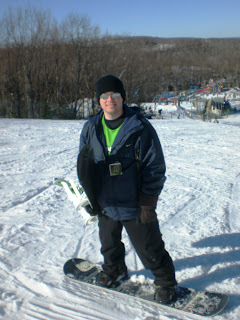 But, I had a ton of fun during the 5 hours or so I spent on the mountain. We did three lifts (a double-green and two greens), and I fell down getting off each, LoL. The final run was very long, and parts of it miiiight have been more appropriately labeled "blue" (and Jonathan agreed so it's not me being a baby, LoL), but we made it. (now some of me learning) We did have to take a break after the second run (our first run didn't require a lift), since Jonathan's bindings weren't playing nice. He ended up having to rent a snowboard, and he's evaluating if they're fixable or if he'll need new ones, and if it's even worth that and we'll just sell this board. About 3:30pm, we broke for lunch, and had fantastic food and service at Thirsty Camel, with a pretty good cover band playing. I had the Italian wrap (one of the best I've ever had, actually), which came with Italian dressing and some yummy tortilla chips (and a pickle). Jonathan went with a cheeseburger and waffle fries, both were delicious. Our server was very attentive to bringing me water (I downed four glasses), which made me happy. My calves were getting really painful (which brought the end of my final run to have problems as well), and my left wrist was sprained, so I opted to take a break while Jonathan did a couple runs on his own. 40 minutes later, we decided that was it time to go (he also banged up his left wrist). 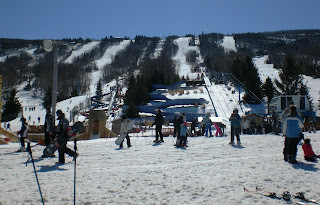 (now for a couple of posed photos) We had hoped to do some snowtubing on our way out (they have 18 chutes and 2 carpet lifts), but we decided we just didn't have the energy. It did mean, however, that we were able to get home by 8:45pm, which was helpful because I was ready to pass out about 10:15... and proceeded to sleep for ten hours. Overall, we'd recommend Camelback as a resort. They had a lot going on (the Mountain Dew Vertical Challenge took place that day as well), and everything was remarkably well-organized (shortest lift waits I've seen for a mountain that busy). There were a lot of injuries (at least seven ambulances that we know of between 9am and 6:30pm), and (I imagine due to it being this late in the ski season) there was a lot of ice on the slopes, but it was a good place with nice people. Nobody yelled at you as you fell and tried to get up again. Most people took care to avoid fallen skiers and beginners and always looked upward when merging onto a trail. Lots of people who were struggling were found along the sides of trails, and there was no shame or pressure to do better. Personally, I'd also like to add that snowboarding is easier and more fun than skiing. The boots are infinitely more comfortable. Slowing down and controlling yourself are much easier. There's a lot more things beginners can do. 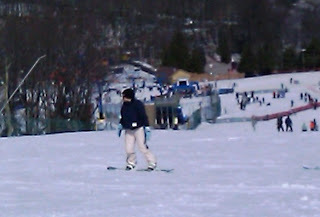 It's harder to get on and off the lifts (at least it is for me), and crazyweird to have to walk and drag the board with one foot (that could be because I ride "goofy" and it leans the other way? ), but so.much.more.fun. I'm kinda sad that I'll have to wait until at least October to learn more. And, if anyone has heelside tips, please share. oooh, and goofy tips, too, since Jonathan only knows how to do everything "regular" style. Ending with a video Jonathan took. I'm wearing khaki pants and a blue jacket. It's rather windy on the video even though it wasn't that bad in real life.